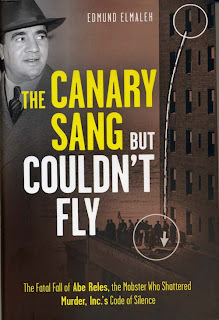 I've been meaning to drop a line about the recently released book on the case of Abe 'Kid Twist' Reles entitled The Canary Sang But Couldn't Fly by Edmund Elmaleh. This is the first book to take an in-depth look at the case following Reles' plunge out of room 653 at The Half Moon Hotel and has some very interesting new insights. While quite a bit of Reles' story has been pressed into ink and paper over the years, not many have followed up on the investigations of the incident aside from some possibly vague assumptions as to who actually may of clipped his wings so to speak. While the first quarter of the book delves into the background and upbringing of Reles' rise in Brooklyn's underworld, it's the remainder of the book where Elmaleh really gets going and sinks his teeth into the material. He reveals how little the NYPD actually did as far pursuing the case and shrugged off responsibility that their number one snitch was killed off under their watch and bungled up the crime scene like a posse of Keystone cops. Brooklyn District Attorney William O'Dwyer, responsible for much of the Murder Inc. roundups and disposals, falls prey to Elmaleh's poison pen as well. With shades of Manhattan D.A. Charles Whitman and the Becker /Rosenthal case coming to mind, he comes across as another power hungry D.A. whose actions were only a step up the political ladder, to which its top rung he almost reached. He also looks into the re-opening of the case in 1951 by then residing King's County (Brooklyn) D.A. Edward Silver after O'Dwyer embarrassed himself at the Estes Kefauver hearings when grilled about the case. Silver smelled cover ups on all sides of the 1941 administration and managed to drag out some dirty laundry. Silver even managed to bring Reles' widow, Rose, out of domestic hiding for the investigation, but she only proved unwilling and infantile in her responses. Fellow stoolies and Half Moon Hotel residents Allie 'Tick Tock' Tannenbaum, Sholem Bernstein, and Mickey Sycoff were also called out secretly after ten years in mob witness exile. Without giving much more away, Elmaleh's theory as to who actually killed Reles is a very interesting and probable one, and one I can agree with (and the notion of it came to me while reading the book as well). Anyone at all curious on the case of Abe Reles should really seek this out. A sadder fact of this book is Elmaleh did not live to see his work get published. After almost ten years of research for the book, he passed away in December of 2008 before seeing all his hard work bound and distributed. This sounds interesting and I'll try to get a copy. I've just finished reading George Wolf's excellent book on Frank Costello, Prime Minister Of The Underworld. Surprisingly this also contains details of Abe Reles and his exit from the Half Moon Hotel.